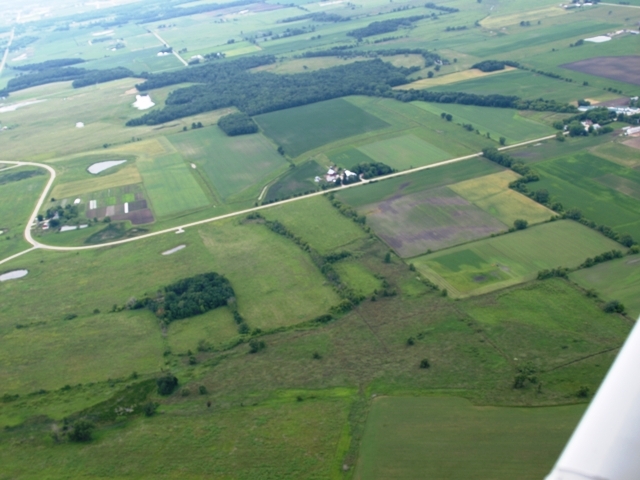 Aerial photo of Oak Center Road with Joe & Nicole Schauer's Good Earth Farm on the curve at the left, Al & Judi Messner's farm in the center, Oak Center and Lance & Melanie Kintzler's farm at the right with the Wild Goose Trail following the tree line. The largest economic business in the Town is agriculture. There are a number of dairy and beef operations. The primary crops grown are corn, sweet corn, soybeans, alfalfa, and winter wheat. There are also a number of small farms that grow garden vegetables and fruits for sale at local farmers markets and CSA's where, for a fee, members receive a share of the fruits and vegetables grown and they share the risk.